It’s #FanFriday and this Friday is extra special. A little over a month ago, two lovely ladies approached me with an idea for a fantastic community. 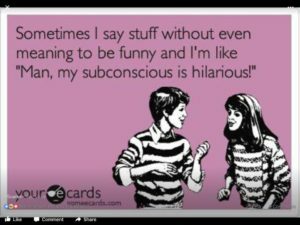 They wanted to build a forum to become involved in supporting my work and to spread the word that, for those who are suffering in any way, laughter and humor can sometimes be the best medicine. 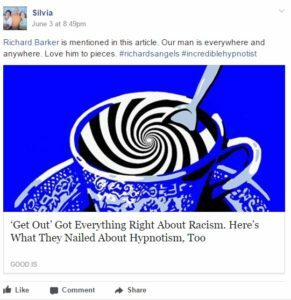 On May 8, 2017, one month ago, the moderators created Incredible Hypnotist Fans: Richard’s Angels. 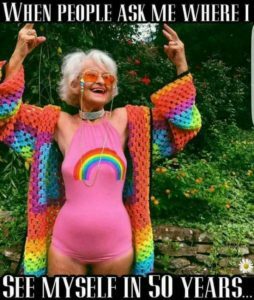 As you will in this special anniversary video, #RichardsAngels is compromised of women from all over the world looking to spread some love, light and humor into this world. Their posts empower one another and in just 30 days, blessings have bounced around the globe. 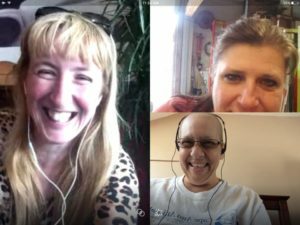 Silvia lives in the U.S. and Fallon lives in England and these two incredible woman manage the #RichardsAngels Facebook Group. The cheer spreading duo hit up the Facebook Group every day with inspiring images, empowering songs and funny videos. Of course these angels have support from other posters like Annette, Kathy, Heleen, Joy, Theresa and Tiffany. Warrior Sylvia shares her story with the group. 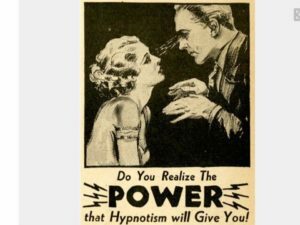 “We would like to invite you to our new fan page celebrating world-renowned #IncredibleHypnotist Richard Barker. This is a wonderful forum to become involved in to support Richard’s work and to spread the word that, for those who are going through hard times, laughter and humor play a large role in keeping positive while battling life’s difficulties. 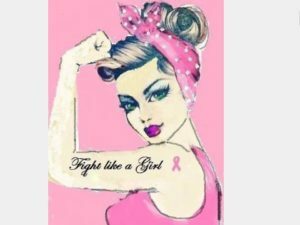 I currently have been diagnosed with Stage 3 Breast Cancer and have undergone a radical mastectomy and just finished a grueling 18 weeks of chemotherapy, next is 32 treatments of radiation. I had a choice to feel self pity everyday or to try to find the positive. I discovered Richard’s videos online and they made me smile and laugh. My husband and daughter are my backbone as I go through my journey, but like all of us, they need a break, too. Over the past month, Silvia and Fallon have grown #RichardsAngels to almost 200 women. Thank you ladies for building such an amazing support group and creating a place where all are welcome. I cannot thank the group enough for all the support and love you’ve shown me. The women have global video conferences and have been known to have a Facebook chat while at the pub. Not too long ago, a touching postcard and gift flew over the North Atlantic Ocean. 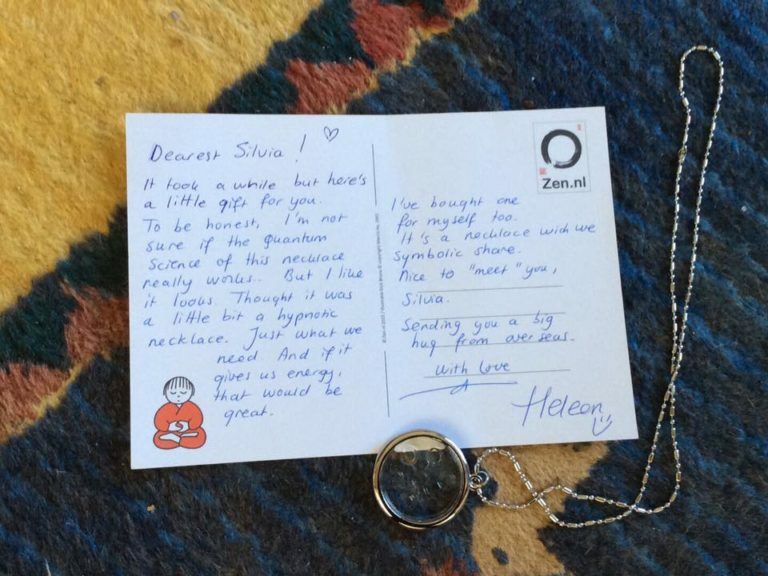 A member living in the Netherlands, shout out to Heleen, sent a package to Sylvia over here in the states. Take the time to read how powerful we can all be when we spread and share love for each other. Several months ago, a woman named Heleen and I connected because of you. I actually wrote you an email about it. I know you are aware of my breast cancer diagnosis, but Heleen just finished treatment. Today in the mail I received this package from Heleen all the way from Holland. Read the post card she sent. It will move you I’m sure, as it moved me. She bought this necklace too, not only because she thought it looked ‘hypnotic”, but also because we could wear them at the same time. As Heleen said, “It’s a necklace which we symbolically share. Without connecting with you, I wouldn’t have met Heleen as well as several other angels including Fallon, Heleen, Annette, Joy, Tiffany, Joni, Corinna and many others. 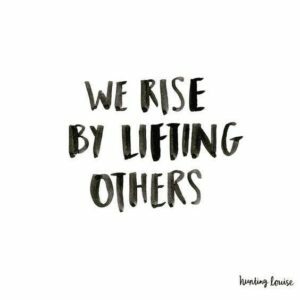 Whether #RichardsAngels are struggling with breast cancer, other medical issues, or just reaching out for support or to support others, you have been a guiding force in helping connect people. You are and will continue to be the #IncredibleHypnotist. HAPPY ANNIVERSARY! YOU ARE ALL TRUE ANGELS. This entry was posted in Blogs and tagged #RichardsAngels, Fan Friday.